The Birmingham Iron players celebrate their win over the Atlanta Legends. Drs. Robert Agee, Jr. and Michael Patterson in the Birmingham Iron locker room. Enter Precision Sports Medicine and Orthopedics. "I stayed persistent," says Robert Agee, Jr., MD, about the year-old medical group earning the position with the new team. 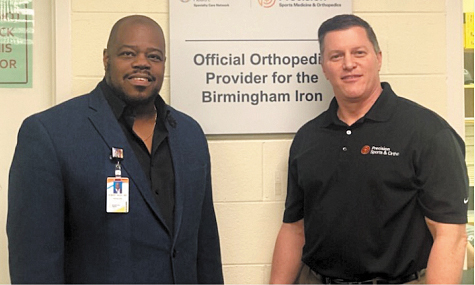 "We're primary care, sports medicine and orthopedic doctors all put together, with Brookwood Baptist Medical Center supporting us if anything falls outside our expertise." The team in their care is the Birmingham Iron, one of eight teams in the newly minted Alliance of American Football (AAF) league. As this goes to press, Iron remains undefeated after three games, with seven to go until the season ends mid-April. Only one other team also prevails unbeaten in the league. For the team physicians, it's not the coach who's in charge. "The trainer runs the show. Our job is to support him," says Michael Patterson, MD, orthopedic surgeon and sports medicine specialist with the practice. "We go out twice a week to check on players. On Wednesday or Thursday, we make a decision as to whether a player can play that weekend." During the games, two of the team's physicians man the Iron sideline, while another supports the visiting side's medical team. There's also an EMT available, an x-ray technician, an airway specialist, a concussion specialist, and a spotter in the box looking for concussion-type injuries that might be missed from the sideline viewpoint. "We make quick emergency decisions on the field, and we have a well-equipped training room with ultrasound and x-ray capabilities, which helps," Agee says. "We're able to do all the things in the training room that we do in the clinic." As a sports medicine physician, Agee has more than 10 years of experience caring for professional athletes from the NFL, MLB, NBA, and the NHL, and has been the past medical director for Legion Field and the NFL European League. He thinks the AAF players may see fewer injuries than in the NFL. "Taking away the kickoff may help lessen a lot of the injuries, like high-impact fractures from high-force collisions from running down the field like a missile," he says. During the game, the on-the-spot assessment presents an unusual urgency not seen when treating amateur athletes. "I covered a lot of high school and college sports before, and this has two differences: the players are bigger, but you see the same type of injuries as in other football. And second, it's more of a business environment," Patterson says. "Diagnoses and management of injuries is on a timetable to get the players back on the field as soon as possible." This is why pro athletes are more open to more extreme treatments, like surgery, than the average patient. "Pro athletes want to have surgery to get back to competing quickly," Patterson says. They also utilize more aggressive healing treatments, like regenerative stem cells and PRP injections. The platelet-rich plasma (PRP) therapy injects a concentration of the patient's own platelets back into the body to accelerate the healing action on injured tendons, ligaments, muscles and joints. "We presently use these in our regular clinic, but they can be a large out-of-pocket cost for patients," Patterson says. But because pro team injuries fall under workman's compensation covered by the league, the physicians and athletes have more leeway for treatments without the critical focus on cost. The business aspect of pro football also means the six sports physicians and orthopedists at Precision Medical can be on-call to the Iron as needed. They also spend up to three hours twice a week in the training room, plus the commitments to game day and travel. "There is a lot of time involved that takes you away from your family and from your practice," Patterson says. "But it's also what I trained to do." On game day, they arrive a few hours beforehand to hold medical meetings with the EMTs and visiting physicians. "To make sure everything runs smoothly," Patterson says. "We talk about things such as what's needed if someone needs an x-ray or the emergency room." After the game, they tend to players who may not have been hurt during the game, but now have concerns. "Game day was a six-hour experience," Patterson says. "The travel will be added to that for away games. It will be taxing, but it will be fun." A lot of the fun, they both say, stems from coming face-to-face with well-known players and coaches. "It's exciting to meet all these high-caliber coaches and players that played in the NFL or just left, and you didn't know what happened to them," Agee says. "Now we see them fit and able to play and hungry for the game, like Trent Richardson." "Yesterday, I was walking around and bumped into Mike Singletary. He's the coach of the Memphis team," Patterson says. "That was a great experience for me."